Ha Long Bay is one of the most popular tourist place in North Vietnam. It is a UNESCO World Heritage Site and is a collection of more than 1000 islands of various sizes most of which are formed by limestones. It is also listed as one of the seven new wonders of the world. It is located around 170 KM east of Hanoi and it takes around 3 and half hours to reach there by bus. It can be reached by public transport or hiring a taxi from Hanoi. Alternatively you can take a group tour from any of the travel agency in Hanoi. Agencies offer various types of tours ranging from a day trip to 3 days trip. The cost of these tours also vary depending on the luxury level. If you do not have much time in hand then you can opt for a day trip which will take you through important spots of the region. 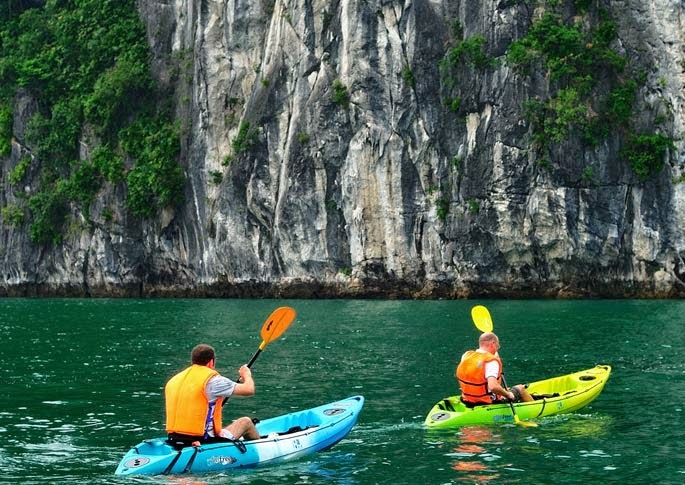 Kayaking Halong Bay tour starts at around 8 AM from Hanoi and you reach around noon time at Ha Long Bay. The bus stops for a break of around 20 mins at a stopover. 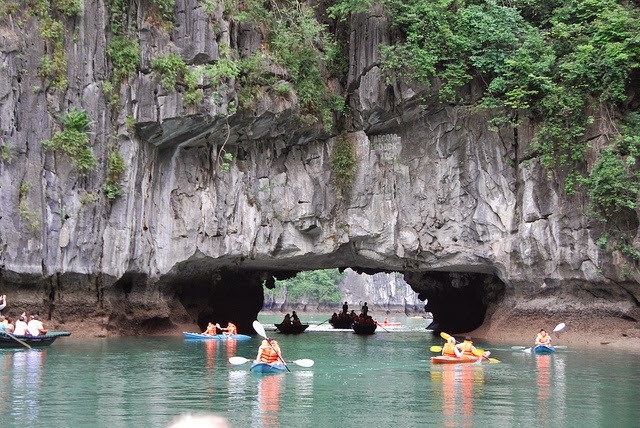 Once you reach Ha Long Bay you will notice two things – The beautiful sea along with hundreds of boats of various sizes and a huge crowd waiting to get on boats. There is a small scam at the shore. After everyone is settled, the boat starts sailing through the sea and you start passing through limestone formations around you. Since it will be lunch time, soon you will be served lunch on the boat. Vegetarian food was available but with extremely limited options of rice, tofu and fruits. You can buy drinks on the boat if required. Food quality was ok just enough to survive for the day. The views from the deck are very nice. You can see limestone formations in all directions. The boat moves steadily in sea water and gentle breeze making it more wonderful. The guide will tell you history of the place along the way. Meaning of Ha Long in Vietnamese is Descending Dragon. Vietnamese people believe that dragon was sent by God to protect land from invaders. The boat then stops at fishing village. From there you take ride in traditional vietnamese bamboo boats passing below the rocks. You can also do kayaking at this place at additional cost. Its a very peaceful place and ideal for kayaking Halong Bay. This is the most beautiful region of the Bay. The final part of trip takes you inside one of the huge caves which are open to tourists. The guide will show you various shapes of rocks which look like various animals. Sunlight enters through very narrow gaps and artificial lights are also places inside caves.